Among the work on sale at Artcurial’s April 5 auction of Impressionist & Modern art in Paris: Henri Lebasque (1865-1937), “La Danse” (Study), 1917. Oil on canvas, 27.17 x 29.92 inches. (69 x 75 cm.) Signed lower right. Artcurial pre-sale estimate: 20,000 – 30,000 Euros. Image courtesy and copyright Artcurial. NEW YORK — Less heralded than the Bolshoi’s return to New York this summer, and yet no less a cause for rejoicing, is the return of veteran Buffy Miller to Eliot Feld’s Ballet Tech, particularly in her patented virtuoso turn, “Ion,” to the music of Steve Reich. If you want to know what it feels and looks like to be inside the music, you’ve got to see Buffy Miller in this Feld dance, as I was blessed to be able to do last night at the Joyce. “This is the best dance I’ve ever seen,” said my companion, and I’d have to put this artist at the top as well. Miller’s feat here rivals not only that of fellow Reich interpreter Anna Teresa De Keersmaeker, but, I can imagine, that of the first ballerina who ever used her awareness of body and hyper-awareness of music to enter another plane and take us there with her. I reference De Keersmaeker because, like that choreographer dancing to Reich in “Fase” Miller’s physical gifts take on a supernatural dimension. She seems to be doing things no ordinary human would find possible, and with this physical magic transcends the corporeal and becomes an element — an ion — in the music. To receive the rest of the article, first published on August 8, 2000, subscribers can contact publisher Paul Ben-Itzak at paulbenitzak@gmail.com. Not a subscriber? Subscribe to the Dance Insider for just $29.95/year ($99 for institutions gets full access for all your teachers, students, dance company members, etc.) and receive full access to our Archive of 2,000 exclusive reviews by 150 leading critics of performances on five continents from 1998 through 2015. Just designate your PayPal payment in that amount to paulbenitzak@gmail.com, or write us at that address to learn how to pay by check or in Euros. You can also purchase a complete copy of the Archives for just $49 (individuals) or $109 (institutions) Purchase before April 14, 2017 and receive a second, free copy for the recipient of your choice. Contact Paul at paulbenitzak@gmail.com . Left: Sharaf DarZaid in action. Photo courtesy Sharaf DarZaid. Right: Laila Boukhari and Sharaf DarZaid of the El-Funoun Palestinian Dance Troupe. Photo by and copyright Osama Silwadi, courtesy El-Funoun. RAMALLAH, Palestine — Anyone who attends a performance by the El-Funoun Palestinian Dance Troupe cannot miss his outstanding stage presence — and not only because of his revealing eyes, distinguished height, olive complexion, and charming smile. Above everything else, Sharaf DarZaid captivates audiences with his exceptional ability to dance as if playing the music with his entire body… and soul; it’s as if the music has possessed him or, rather, as if he has possessed it, with skill, with distinctive talent, with passion. Sharaf, with whom I’ve worked as trainer and choreographer for El-Funoun, was named after Sharaf at-Tibi, the first student martyr at Birzeit University, near the West Bank city of Ramallah. He grew up in a warm, caring family that cherishes Arab-Palestinian folk dance and music. During the 1948 Nakba, when more than 750,000 Palestinians were displaced and became refugees, Sharaf DarZaid’s family was uprooted from Beit Nabala, a village near Lydda. (Click here to read more about the Nakba.) Unlike the more than 400 villages that, by some accounts, were bulldozed by Israel at the time, Beit Nabala was spared — at least temporarily. The DarZaids and their fellow villagers paid regular, clandestine visits to their abandoned homes to recover whatever items they held dear. Sharaf’s great-grandfather, for instance, wanted more than anything else to retrieve his radio, one of only two in the entire village. In 1952, four years after the end of the war, Beit Nabala, along with other villages, was completely destroyed, effectively preventing refugees from returning and reclaiming their lands and possessions. As a twist of fate, the ruins of Beit Nabala later buzzed with airplanes flying from Israel’s main airport, which occupied part of its land, while one of the village’s sons, Sharaf, learned to fly in other ways — dancing! Abruptly and violently cut off from their roots, their homes and their olive groves, the DarZaids settled in Ramallah, occupied by Israel since 1967, and had to start over. Ironically, their crushing sense of loss, injustice and devastation as refugees fuelled their sense of identity and triggered in them an inextinguishable desire for self-realization, for assertion of their humanity. Longing to return home was thus transformed from passive nostalgia into active energy, enhancing their self-esteem and transforming them from mere victims to conscious, self-determined subjects. Sharaf’s father became a respected mathematics teacher in one of Ramallah’s elite schools; his mother graduated from Al-Quds Open University with a B.A. in social work. Together, they raised four special children, nourishing in them a profound awareness of their identity, a simple dream to become whole again, and a tenacious quest for freedom, equality and dignity. It is this particularly stimulating environment that nurtured in Sharaf his initial reverence for dance. Through dance, he narrated his innermost dreams; he counselled his tensions and fears; and he expressed his resistance to oppression, whether political or social. Before becoming a dancer, Sharaf, like many Palestinian kids his age, growing up under the oppressive reality of colonial rule, felt a burning urge to participate in protest demonstrations against the Occupation. Only thus did he feel empowered… and free. Free to make his own decisions. Free to shout his guts out. Free to exercise his will in standing up to an overwhelmingly frightful foe. Free to prove to himself — and to his peers — that he would no longer accept the role of powerless victim. In El-Funoun’s youth group, Sharaf’s skills were sharpened and his talent matured. Even his size underwent a dramatic change: he became a tall and handsome — though still slim — young man. Ultimately, Sharaf managed to reconcile his patriotic motives and unrelenting youthful bravado with what he perceived as a new, equally needed form of resistance: dance. After he grew up to join El-Funoun’s adult group, Sharaf bumped into a new style of dance that not only tried his talent but also challenged his artistic taste. El-Funoun was — and still is — experimenting with what it terms contemporary Palestinian dance, a genre inspired by and rooted in Arab folk dance, but in dialogue with universal techniques and influences, including several Western forms. Sharaf’s visible irritation with this ostensibly alienating and unfamiliar contemporary movement terrain soon gave way to an unwavering resolve to absorb the new forms with diligence, persistence and, crucially, patience. With such determination, it wasn’t long before Sharaf proved himself in this more modern realm, too, as a virtuoso to be reckoned with. Still, his true love was for dabke. My first encounter as a choreographer with Sharaf came when I created a flirtatious courting dance that included a relatively daring duet for which I selected him and a vivacious female dancer, Laila Boukhari. Both Sharaf and Laila, as well as the rest of the young dancers, had difficulty learning several parts of the larger dance. But, with the duet, things went unpredictably smoother! The two were asked to touch each other by their foreheads; turn, while still in contact; and then rest their heads on each other’s shoulders. Admittedly, I intended this moment to capture the audience’s undivided attention and to slightly push the limits of what is acceptable, or tolerable, for an average Palestinian spectator. To my utter surprise, Sharaf and Laila nailed the movement, showed brilliant chemistry, and perfected the required expressive content in just one rehearsal. Later, during performances, I was stunned that all the whistling, cheering and applause this intimate moment inevitably generated among audiences never loosened the couple’s focus or distracted their fixed gaze in each other’s eyes. After some time, I was embarrassed to learn that I was the only one in El-Funoun who did not know that the two had been infatuated with each other for quite some time! Besides being one of the main dancers — all are volunteers — of El-Funoun, Sharaf, who is now 19, is a student of finance at Birzeit University. He also teaches dabke to youth in Saffa — a small, picturesque village to the west of Ramallah — as part of a program organized by the Popular Art Centre, a leading community arts organization, in cooperation with El-Funoun. When I saw the Saffa group, Handala, perform last year, I was moved primarily by how the young novices respected what they were doing. They took themselves seriously, without losing their spontaneity and authentic character. They looked up to Sharaf, who is practically their age, as a role model, particularly because he developed a remarkable way of reaching their minds and hearts, without undermining the significance of the process of creating dance. Sharaf’s own respect for dance and for communicating through dance was a source of inspiration for them. Although he may lose himself in dancing, as if bypassing the stage, the audience, and all the boundaries to reach the sky, Sharaf never loses his grip on the music or movement. Of all the touching moments in “Sharaf,” nothing quite strikes me as much as when Sharaf jumps so high that it’s as if he’s flying, soaring above all the wounds, the phobias, the injustices, and the fetters, into the promising horizon. Among the under-projected classics screening April 18 – 26 at the Museum of Modern Art for Making Faces on Film: A Collaboration with BFI Black Star is the 1943 all-star extravaganza “Stormy Weather,” featuring Lena Horne and Bill ‘Bojangles’ Robinson (above), Cab Calloway, Fats Waller, Dooley Wilson, the tap-flying Nicholas Brothers, Katherine Dunham and her Troupe, and just about every other major African-American performer of the epoch. Directed by Andrew L. Stone, the movie was meant to help the recruiting effort among African-Americans. The MoMA mini-festival celebrates the legacy of African-American artists working both within and outside the mainstream film industry. Image: Film Study Center Special Collections, The Museum of Modern Art. First published on the Dance Insider on May 23, 2006, on the occasion of Katherine Dunham’s death. 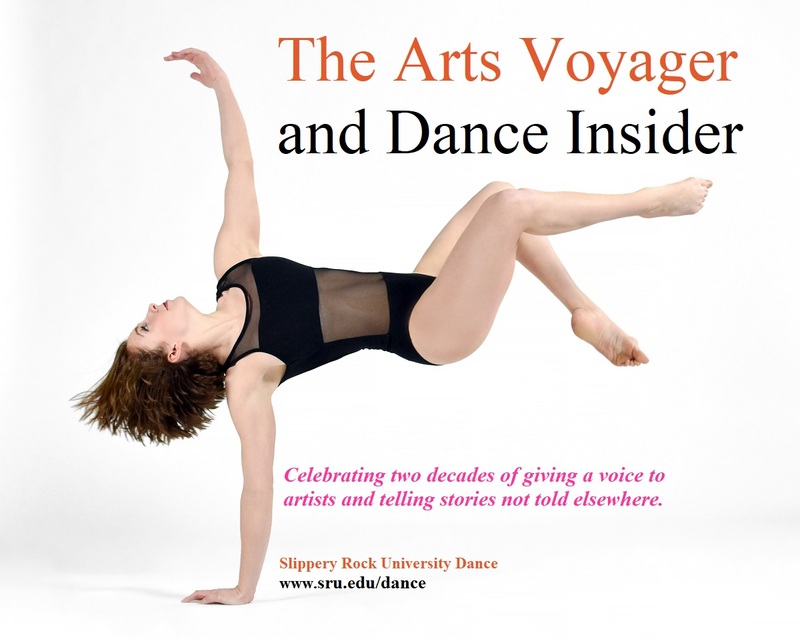 From the DI Archives of 2,000 exclusive reviews by 150 leading dance critics of performances on five continents from 1998 through 2016, plus five years of the Jill Johnston Letter and trail-blazing reporting and commentary on the leading dance news of the era. Want more? You can purchase a complete copy of the Archives for just $49 (individuals) or $99 (institutions) Purchase by March 22, 2017 and receive a second, free copy for the recipient of your choice. Contact Paul at paulbenitzak@gmail.com . NEW YORK — Bill Shannon, a.k.a. Crutchmaster, is a challenge. He challenges the modern dance concert stage in Saturday night’s performance of “Old Rain,” seen at P.S. 122’s second floor theater, and challenges our notions of good Samaritans a little later Saturday night, now downstairs, in his “point and click” video presentation “Regarding the Fall.” He is a provocateur, and I happily admit I have been provoked into a heavy bout of thinkin.’ It’s a delight to again witness Shannon gliding across the stage, having first seen him at an improvisation concert a few years ago. The wings of his custom-designed crutches allow him to slow time and suspend motion midstream. Though “Old Rain” reveals a great amount of personal pain, Shannon still gives us bipeds, at least primarily bipeds, air time to envy. His hips are unable to support his torso due to a rare disease, but his legs work. Paired with the strength of his upper body and NoriCat’s rounded-edge crutches, he’s got the speed and grace of a gazelle. To receive the rest of the article, first published on December 11, 2000, subscribers can contact publisher Paul Ben-Itzak at paulbenitzak@gmail.com. Not a subscriber? Subscribe to the Dance Insider for just $29.95/year ($99 for institutions gets full access for all your teachers, students, dance company members, etc.) and receive full access to our Dance Insider Archive of 2,000 exclusive reviews by 150 leading dance critics of performances on five continents from 1998 through 2016, plus five years of the Jill Johnston Letter. Just designate your PayPal payment to paulbenitzak@gmail.com, or write us at that address to find out about payment by check or in Euros. You can also purchase a complete copy of the Archives for just $49 (individuals) or $99 (institutions) Purchase by March 21, 2017 and receive a second, free copy for the recipient of your choice. Contact Paul at paulbenitzak@gmail.com .